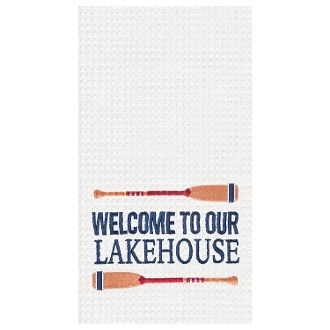 Welcome to Our Lakehouse Kitchen Towel a nice addition to any lakehouse. This towel includes a waffle weave design. Size is 8" x 15" (folded), 18" x 30" (unfolded). Machine wash cold only. Embroidered with Welcome to Our Lakehouse Kitchen. 8" x 15" (folded), 18" x 30" (unfolded).